The Eurasia Tunnel a mega project in Istanbul opened on the 20th December 2016 , the sister tunnel to Marmaray which allows automobiles to transit access from Asian to European sides of Istanbul travelling under the Bosphorus to relieve some of Istanbul’s heavy traffic ways. The opening ceromony was attended by President Recep Tayyip Erdoğan, Prime Minister Binali Yıldırım and many other foreign guests including ministers and ambassadors , The Eurasia Tunnel now connects Asian and European continents underneath the Marmara sea bed , it will provide a cutt down travel time of just 15 minutes between the two sides of Istanbul. The Eurasia Tunnel, which will considerably decrease the travel time between Istanbul’s Kazlıçeşme on the European side and Göztepe on the Asian side, which was prepared in relation with the three existing bridges crossing the Bosphorus strait. The two-story tunnel, is 14.5 kilometer long, including a 5.4-kilometer section under the Bosphorus, has been built and constructed for rubber-wheeled vehicles alone. The traffic movement will become smoother thanks to the expansion and regulation of connection roads at the exit and entrance of the tunnel, the tunnel will also help decrease environmental pollution and noise. Plus reducing the travel time from 100 minutes to 15 minutes on a route with substantial traffic. The project is the shortest route between Kazlıçeşme and Göztepe, it will reduce fuel material costs, as well as the quantity of harmful gas discharged into the air and the maintenance costs of vehicles. The construction of the Eurasia Tunnel started in 2011 and has cost an approximate $1.25 billion. 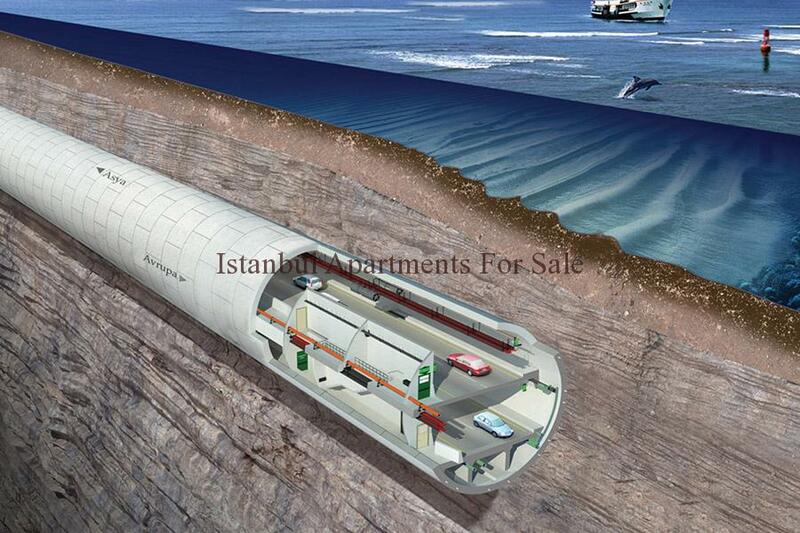 Built 106 meters under the Bosphorus, the tunnel is anticipated to be used by 100,000 vehicles per day. 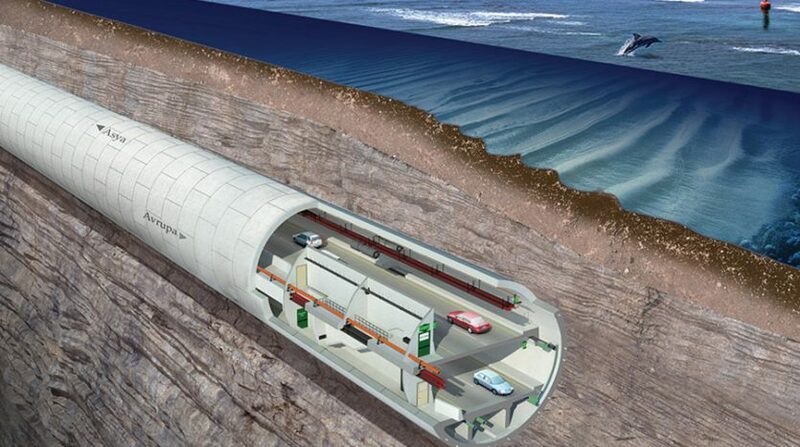 The Eurasia tunnel will also offer uninterrupted 4.5G mobile data service at 106 meters below the sea level. The inclusion will be provided with 16 radio station transmitters. Rather than the Free Toll Collection System used on the Fatih Sultan Mehmet Bridge, the Eurasia Tunnel features counters amid each lane, very much like the July 15 Martyrs Bridge. To avoid traffic jams, tolls will be collected via automatic systems and there will be no options for cash payments. There are no exclusive lanes for Electronic Toll Collection System (OGS) and Fast Toll Collection System users. Automobilist can use all lanes regardless of the system they are using. The tolls will be $4 plus VAT for automobiles and $6 plus VAT for minibuses using one direction in the first year. The General Directorate of Infrastructure Investments of the Ministry of Transport, Maritime Affairs and Communication selected Eurasia Tunnel Operation Construction and Investment Inc. (ATAŞ) to design, construct and operate the project for 24 years and five months. After 24 years, the tunnel will be transferred to the public. Eurasia Tunnel is amongst the most valuable investments with regards to creating a solution to the heavy traffic problem of Istanbul, which aims to host huge international events in the coming period. TomTom, one of the leading navigation business’s in the world, has declared Istanbul as the second city with the heaviest traffic load in the world. Moscow ranked first in TomTom’s 2012 traffic jam index with 66 percent, Istanbul came in second place with 55 percent. The data acknowledges that Istanbulities on average waste a total of 118 hours yearly just for a 30-minute travel each day. It can take a one-hour distance an average of two hours and four minutes due to traffic congestion. Hense, the Eurasia Tunnel will considerably reduce the travel time between Kazlıçeşme and Göztepe, fetching it down from 100 minutes to 15 minutes. Therefore the Eurasia Tunnel will give and provide a fast and safe travel to the Istanbulities. With the expansion and regulation of the access roads located at the tunnel’s entrance and exit, the traffic will run easier with speed. The usage of current passages between Kazlıçeşme in the European side and Göztepe in the Anatolian side creates a long-distance and vehicle-intensive trip, and this has a adverse effect on fuel consumptions and vehicle maintenance costs. Since Eurasia Tunnel Project is the shortest route between Kazlıçeşme – Göztepe, the fuel cost will reduce. The fast traffic in the Eurasia Tunnel will add to the fuel economy, and also reduce the maintenance fees of the vehicles. The drivers will be charged for the vehicle and they will not pay any extra charge for the passengers. One of the world’s best engineering projects, the Eurasia Tunnel will have an enhanced system for its 24/7 safe, healthy and uninterrupted traffic flow. Constructed with the best technology advanced design, and engineering applications, the tunnel is constructed to withstand earthquakes of magnitude up to 7.5 on Richter scale and tsunami. Furthermore, with its advanced security features, it can be used as a shelter when necessary. The tunnel will offer high-capacity ventilation system, modern lighting technology and special fire system conveniently accessed from all sides of the tunnel, fire resistant surface coating, emergency evacuation systems and safety strips located every 600 meters. The tunnel includs a closed-circuit camera system, which oversees every corner 24/7, communication and notification systems, and event detection systems. Speed control inside the tunnel will be provided by some high technology infrastructure. The Eurasia Tunnel Project is outlined to improve driving comfort. Increasing comfort of travel with Modern lighting, high-capacity ventilation and low-slope features. The two-story tunnel will provide uninterrupted travel even in bad weather conditions such as fog and icing. Environment-friendly Eurasia Tunnel will decrease fuel consumption and the amount of harmful gas released into the air by shortening travel distances and giving traffic movement flow. With an exemplary Environmental and Social Impact Assessment (ESIA) report with international standards, the Eurasia Tunnel is a highly sensitive project for the environmental and social impacts.